Sometimes, I get funny little texts or emails or phone calls from friends about cooking. Dear Si, I need new soup recipes. Please. A month and a half later, I’m coming to her rescue. Good thing she didn’t fall into quicksand. Here is a recipe I made. just for you. Sorry not soon. 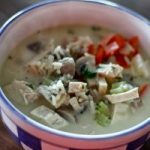 Place chicken in slow cooker with 2 cans chicken broth. Generously salt and pepper. Place lid on slow cooker and cook for 2 hours on high. Remove chicken, chop and set aside, leaving broth in slow cooker. Replace lid, leave temperature on high. Add chopped mushrooms, celery, carrots and box of wild rice mix and flavor packet. Replace lid and cook for another 30-45 minutes on high or until rice is done. Add chicken, chopped parsley and 1/2 cup half and half or cream to ingredients in slow cooker. Replace lid and cook an additional 10-15 minutes, or until heated through. -I doubled this so we had enough for dinner, and some to give to a family with a new baby.-I used Uncle Ben's Wild Rice mix. You may use any brand available that is approximately 6-8 oz.-This recipe may be made either in a slow cooker, or on the stove top.If stove top:Cook the chicken in broth for about 20 minutes boiling on high heat. Remove chicken and chop. Set aside.Follow directions above, except, cook the rice in the broth and additional cup of water according to package directions, adding the mushrooms, celery, and carrots as well.-If the soup seems a little thick, you may add more water, broth or cream.-This soup may be made with any combination of added vegetables.Additional suggestions: water chestnuts, onion, corn, peas. This recipe looks easy and oh so good Si. It's definitely soup weather around here. Just making sure that it's a cup of parsley? Yes a cup, but loosley packed I'll update the recipe to reflect the change! I see add flavor packet? My wild rice doesn’t have one. Any suggestions to substitute? Thank you! Haley, Im not sure, if the flavor is lacking, you could maybe use chicken broth instead of water the next time you make this recipe! Does this freeze ok? Stocking the freezer for a new mom and want to make sure it will thaw/reheat ok. Thx!